Nerve compromise can result from postural distortions that are easily revealed with a few simple tests. We’ve simplified them so you can conduct them at home with a minimal amount of time, equipment and training. Naturally, they aren’t a substitute for a professional evaluation. Simply study the pictures, follow the directions and conduct the tests. If the results indicate that you or a loved one is a good candidate for chiropractic care, call Sandy to arrange a thorough examination in our office immediately. 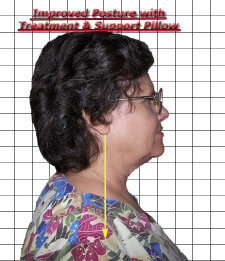 Neglected, spinal problems worsen and make correction more difficult and expensive later. Can Chiropractic Care Help You ? Do your shoulders appear uneven? Does your head drift forward from your shoulders? 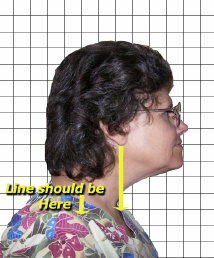 Ear lobe should approximate alignment with point of shoulder.